A team of researchers working with Google's DeepMind division in London has developed what they describe as a Generation Query Network (GQN)—it allows a computer to create a 3-D model of a scene from 2-D photographs that can be viewed from different angles. In their paper published in the journal Science, the team describes the new type of neural network system and what it represents. They also offer a more personal take on their project in a post on their website. Matthias Zwicker, with the University of Maryland offers a Perspective on the work done by the team in the same journal issue. In computer science, big jumps in systems engineering can seem small because of the seeming simplicity of results—it is not until someone applies the results that the big leap is truly recognized. This was the case, for example, when the first systems began to appear that were able to listen to a what a person says and extract meaning from it. In this new endeavor, the team at DeepMind might have made a similar leap. In traditional computer applications, including deep learning networks, a computer must be spoon-fed data in order to behave as if it has learned something. That is not the case for the GQN, which learns purely from observation, like human infants. 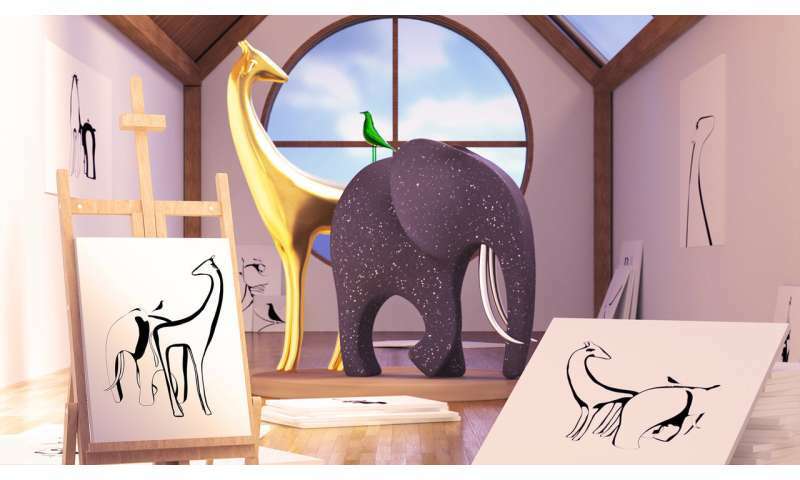 The system can observe a real-world scene, such as blocks sitting on a table, and then recreate a model of it able to show the scene from other angles. At first glance, as Zwicker notes, this might not seem all that groundbreaking. It is only when considering what the system must do to come up with those new angles that the real power of the system becomes clear. It has to look at the scene and infer characteristics of occluded objects that cannot be observed using only 2-D information provided by cameras. There is no radar or depth finder, or images of what blocks are supposed to look like stored in its data banks. All it has to work with are the few photographs it takes. Accomplishing this, the team explains, involves using two neural networks, one to analyze the scene, the other to use the resulting data to create a 3-D model of it that can be viewed from angles not shown in the photographs. There is much more work to be done, of course, most obviously, determining if it can be broadened to more complex objects—but in its primitive form, it clearly represents a new way to allow computers to learn.